Do you ever ponder the writing rituals of famous authors? Pondering is okay, but don’t use their habits as a model for your own behaviour…. 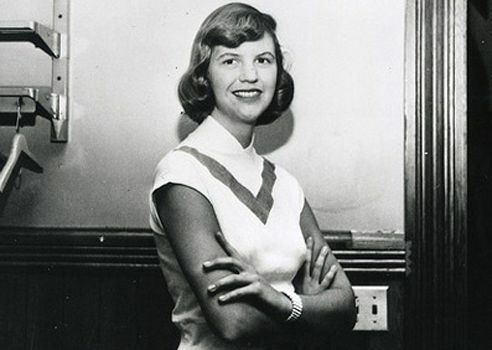 Did you know that Sylvia Plath (pictured above) and Benjamin Franklin started their writing days at 4 am and 5 am, respectively? Oliver Sacks was also a morning lark (5 am) as were Margaret Mead and Immanuel Kant. But before you leap to the conclusion that the early morning bird always catches the word, be aware that F. Scott Fitzgerald, James Joyce and Gertrude Stein didn’t start until late morning, after 10 am. And there were other famous authors who wrote exclusively at night: Samuel Johnson, Marcel Proust, and George Sand, among them. What I’m trying to say is that it is not helpful to try to follow the path of previously successful writers, because we are all individuals. What works for Barbara Kingsolver may not work for you — and that’s not a problem. Some writers even had very strange habits. Victor Hugo, for example, had a servant take away his clothes when he needed to write. He couldn’t leave the house naked, so his habit forced himself to stay at his desk. Do you really want to start doing that? Instead of trying to emulate famous writers, develop your own habits that work for you. Identify a time of day during which you can be a productive writer and protect that time as if you were guarding the crown jewels. Generally, I think it’s better to write in the morning, mainly because it’s easier to protect that time. But if you’re a committed night owl, ignore my advice and write in the evenings. Or the middle of the night, if that suits you better. How much should you write each day? You are the only person who can answer that question. Your writing experience and your natural aptitudes both play a role here. They alone will determine how many words you are able to produce each day. And if you set your goal in the Michael Crichton range (10,000 wpd), I predict you are going to be very disappointed if you turn out to be “only” an Ernest Hemingway (500 wpd). Instead of giving yourself an arbitrary goal, start by figuring out what is natural and feasible for you. What can you do every day, even if you’re having a bad day? If it’s 150 words per day, so be it. Strive for that goal. Members of my Get It Done group report in to me five days a week, documenting their word count achievements or their editing time. This accountability forces them to be productive and keeps them on track. If such a program is not for you, then figure out a way to get similar accountability from friends and family. Really, the only issue that matters with writing, is not how much you do or when you do it but THAT you do it, day after relentless day. My video podcast last week offered advice on what type of editor to hire. Or see the transcript, and consider subscribing to my YouTube channel. If you have a question about writing you’d like me to address, be sure to send it to me by email, Twitter or Skype and I’ll try to answer it in the podcast. Have you ever been tempted to copy the writing rituals of famous writers? We can all learn from each other so, please, share your thoughts with my readers and me in the “comments” section below. Anyone who comments on today’s post (or any others) by May 31/18 will be put in a draw for a copy of the non-fiction book 59 Seconds by Richard Wiseman. Please, scroll down to the comments, directly underneath the “related posts” links, below. Note that you don’t have to join the commenting software to post. See here to learn how to post as a guest.